The Algarve is the most popular tourist destination in Portugal and one of the most popular in all of Europe, receiving millions of tourists every year. Tourist activity sees the summer population of the Algarve triple, with many being seasonal tourists that have purchased holiday homes in the region. 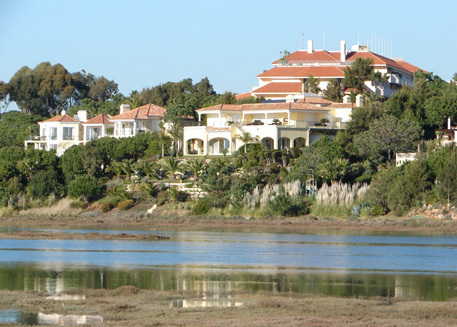 Most people looking to buy property in Portugal do so in the Algarve, resulting in a very robust property market across the region. 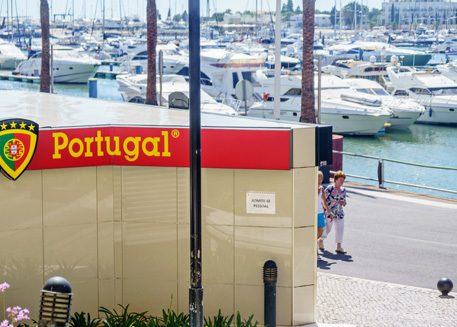 The Algarve’s economy is dominated by the tourism industry, with a wide selection of popular tourist destinations, including Portimão, Praia da Rocha, Lagos, Albufeira, Vilamoura, and Faro attracting millions of visitors each year. 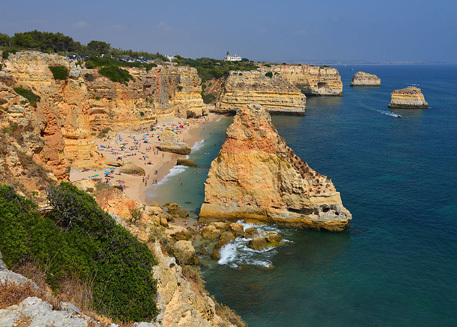 Low-cost air travel has helped to strengthen tourism in the Algarve, with European countries such as France, Germany and the UK being just few hours travel by plane. 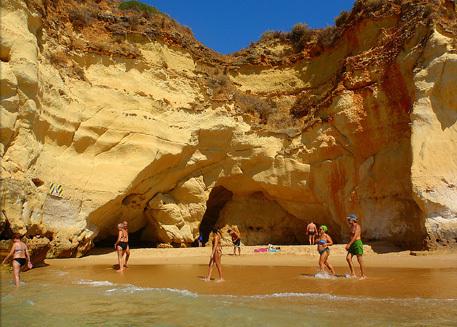 In fact, the largest percentage of foreign tourism in the Algarve comes from Europe. The warm Mediterranean climate is one of the main attractions of the Algarve, although it’s certainly not lacking in other sights. 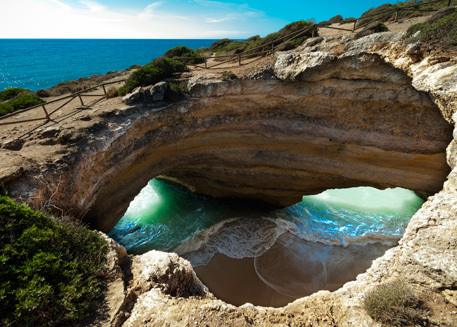 With 160km of gorgeous coastlines, golden sandy beaches, world-class golf courses, magnificent local cuisine and an average of 300 days of sunshine each year, it’s little surprise the Algarve remains a tourist hotspot. The Algarve is the southernmost region in Portugal and is home to a warm Mediterranean climate with an average of 300 days of sun. Gorgeous sandy beaches, lagoons, coves, caves and cliffs are found across 160km of stunning coastline, where many towns and cities are found. This offers plenty of choice for buying property in the Algarve. 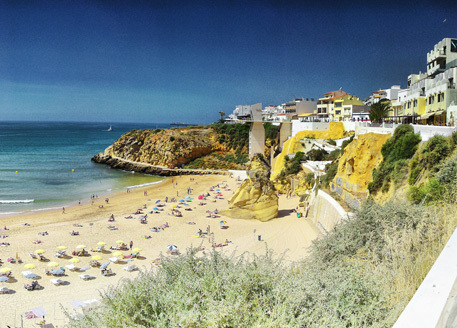 Located in the central region along the cost of the Algarve, Albufeira is a short distance from Faro Airport. It was founded as a fortified Roman town, developing into a prominent fishing village before growing into a thriving tourist destination. 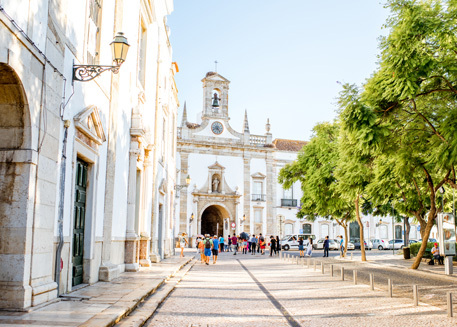 A very popular tourist destination and one of the largest towns in the Algarve, Lagos offers plenty of modern tourist attractions, including a vibrant night life with ample bars, not to mention a great range of restaurants, cafés, and shops. It also boasts a rich history with much of its classic architecture remaining intact in the old town area, offering a more tranquil experience. 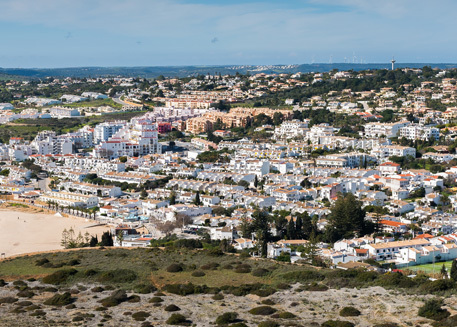 Situated on the western region of the Algarve, Praia da Luz is an idyllic town offering a more relaxing experience for tourists. It enjoys incredible weather and is home to a gorgeous beach that isn’t overpopulated with tourists. A popular destination for expats and retirees, this charming town is on the smaller side, which is all part of the charm and appeal. 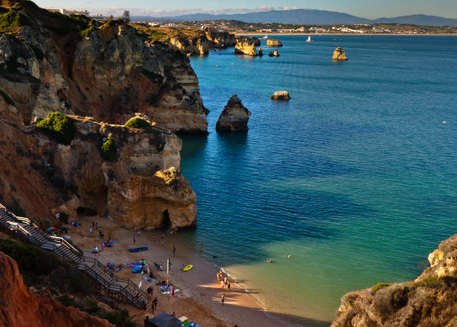 The Algarve is one of Portugal’s most scenic locations, with stretches of golden beaches, rugged cliffs, pristine waters, and many picturesque towns and villages. There are countless landmarks worth visiting in the area, some of which are natural and others that are manmade. The remnants of a stunning medieval castle built in the 11th century, Silves Castle is one of the most-visited landmarks in all of Portugal, located in the municipality of Silves in the Algarve. This former Moorish stronghold remains well preserved, with tourists able to walk along the intact sandstone walls and explore the various cobbled buildings and cisterns in and around the town of Silves. One of the most historically significant landmarks in the Algarve, it is said that Prince Henry the Navigator began his school of navigation in the fortress, ushering in the Golden Age of Portuguese exploration. Visitors can expect breath-taking panoramic views of the ocean, cliffs, and beyond, but it’s the sights inside the fortress that really impress, such as the Rosa dos Ventos, a massive pebble compass used by Henry himself. One of the more remarkable natural landmarks in the Algarve, the Ponta da Piedade is an incredible wedge of headland located just outside of Lagos. While there are beaches here, it’s not the type for sunbathing, as rugged sandstone cliff formations dominate the coastline, coming together with the blueish-green waters of the Atlantic Ocean to create a stunning natural landscape. There’s an abundance of attractions around this landmark, with caves, grottos, quiet beaches, and rocky outcrops all worth exploring, especially when done by boat. The cliffs, carved out by wind and the ocean, offer incredible views of the Atlantic, while a variety of bird species reside in the area. Located in the idyllic town of Tavira (which is a gorgeous landmark in its own right), the Old Roman Bridge is one of the oldest landmarks in the Algarve - its origin is still debated to this day. It’s thought a different bridge was first constructed in the spot around 3rd century B.C, eventually being replaced during medieval times. 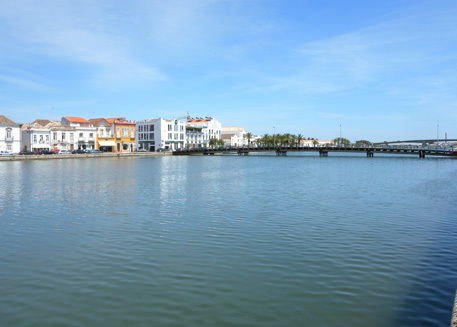 The current bridge’s design dates to the 17th century, as the bridge suffered centuries of wear and tear prior this, being the main crossing of the Gilão river that flows through Tavira. Now, only visitors by foot are permitted to walk across the bridge, offering a fantastic view of Tavira and beyond. The original settlements of the Algarve date to approximately 1000 BC. These settlements and trading ports were established by the Phoenicians, who sought to mine the rich natural resources of the land. The Phoenicians originated from the coastal areas of the eastern Mediterranean, around modern-day Israel and Syria. Portimão was one of the first major settlements in the Algarve, established around 550 BC by the North African Carthaginians. Around the 2nd century BC, Roman rule came to the Algarve and the wider Iberian Peninsula. There are many Roman ruins still standing to this day, highlighting the rich and diverse history of the Algarve. After the fall of the Roman Empire, the Algarve was controlled by the Visigoths, although they would soon be conquered by the invading Moors of North Africa at the Battle of the Guadalete, circa 711 AD. By 716 AD, the Moors had control of the entire Algarve and most of Iberia, ruling for five centuries. 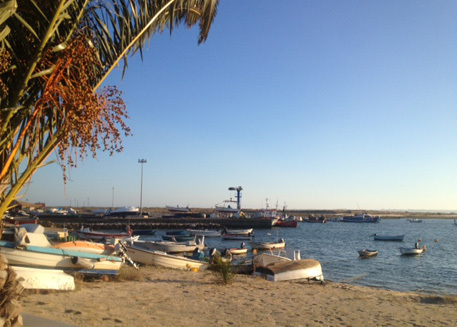 The Arab rulers renamed Santa Maria into Faraon - the Settlement of the Knights - which is now modern-day Faro, the capital city and municipality of the Algarve. In fact, the name Algarve originates from the Moors, referring to the region as al-gharb - the West. 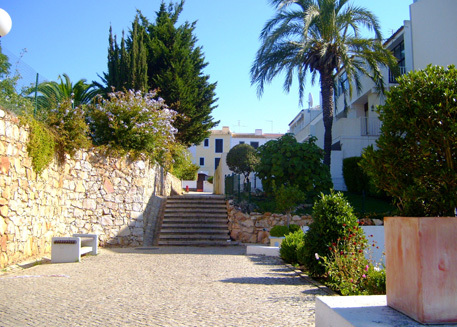 Their presence shaped the region for centuries, and much of their architecture remains standing throughout the Algarve. The best example of this would in the town of Silves, which is home to a remarkably intact Arabic castle constructed during Moorish rule. Built in the 12th century, it has a distinct red hue due to the sandstone used to construct the castle - it remains one of the best-preserved Moorish castles in all of Portugal. In the 12th century, the Algarve - and all of Portugal - returned to Portuguese rule after the victory of King Alfonso III, who expelled the Moorish conquers from the land. It would not be until the mid-13th century that the Algarve was free from Moorish attacks. The Portuguese discoveries would soon follow, with Henry the Navigator himself said to have operated in the Algarve, basing himself somewhere around Lagos and Sagres. What is believed to be his navigation school can still be visited today, where it is thought he planned much of his maritime expeditions to Africa. He would also discover and claim the islands of Madeira and the Azores, eventually being appointed the governor of Algarve in 1419. Trade flourished in the area, with the riches of the Portuguese Empire bringing great wealth to the Algarve. This was until a devastating earthquake that struck in 1755. Many of the settlements in the Algarve where heavily damaged by the earthquake and subsequent tsunami, the latter of which was responsible for most of the destruction. A brief Spanish occupation would follow during the Napoleonic invasion of northern Portugal, although the region was the first to drive out the Spanish after several battles throughout the towns and settlements in the Algarve. After the Portuguese Civil War - where many battles were fought in the Algarve - the First Portuguese Republic was established in 1910. This signalled the end of the Kingdom of Portugal and the Algarve, giving way to the modern-day Algarve that we all know. 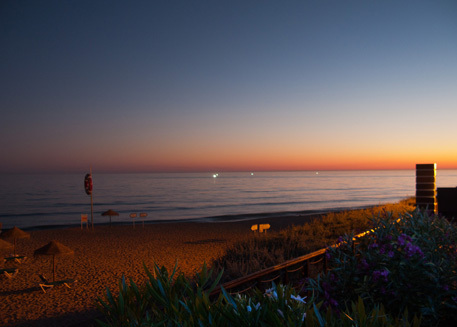 The Algarve enjoys a wonderful Mediterranean climate throughout the year, with warm summers and mild winters. On average, the Algarve gets around 300 days of sunshine each year, highlighting just how impressive the weather is - there’s a reason it’s such a popular tourist destination! This means clear blue skies for most of the year, infrequent rain and soaring temperatures during the summer months where the sun is out for 12 hours a day. Winters are great too, as there are very few days where temperatures drop below zero degrees, although there is a little more rain during these months. There is some diversity to the climate in the Algarve, namely due to it stretching across 155km of coastline. 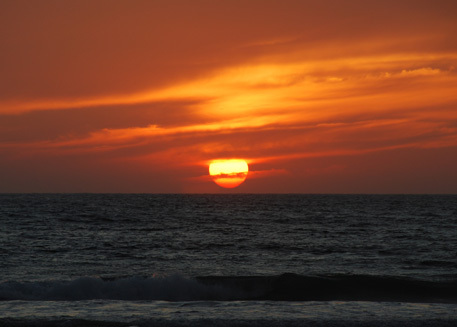 For example, the eastern region of Algarve tends to enjoy warmer temperatures and less rain on average compared to the western and central regions. The differences aren’t too significant, but they may be beneficial for those that don’t want it to be overwhelmingly warm all summer. 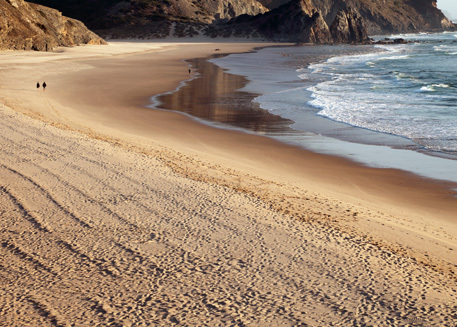 Of course, if you are searching for the warmest, sunniest weather possible, then eastern Algarve is where to find it. Another notable aspect of the Algarve climate is the wind. Because it’s situated between the Mediterranean Sea and Atlantic Ocean, the Algarve is often quite windy, receiving a pleasant breeze from the Atlantic. Many people enjoy this cooling breeze, as it makes the heat less intense, but it’s important to remember the temperatures are still high and should be treated as such. The waters across the Algarve enjoy a nice temperature too even though it’s normally colder than the Atlantic, mainly because of the nearby Mediterranean Sea. The wind and water combination make water sports especially popular in the Algarve - the water does get colder during the winter however! The Algarve is also home to a truly wonderful environment, with some of the most breath-taking geography in all of Portugal. 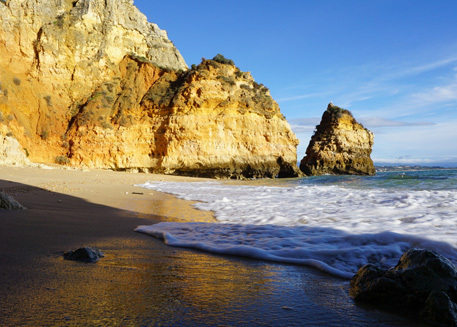 Being the south coast of Portugal, the Algarve boasts a 155km coastline with stunning landscapes. Perhaps the most notable of these is the countless golden sandy beaches that meet with the azure waters of the Atlantic to create a beautiful coastal area. 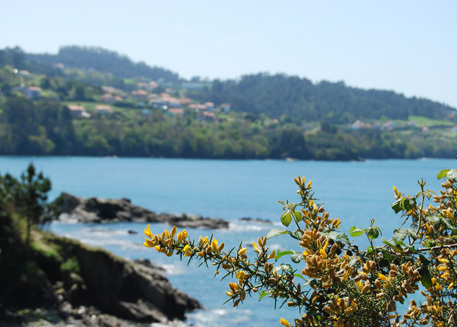 Much of the coast has a backdrop of rugged sandstone cliffs with wonderful yellow and red hues. You will find caves, creeks, outcrops, bays and lagoons littered across the Algarve coastline, most of which can be explored by boat tours or by taking a dip in the ocean. The Algarve has a rich and diverse culture, thanks to wide range of cultural influences over its long history. Today, the Algarve is a multi-cultured region blending both contemporary and traditional Portuguese lifestyles. 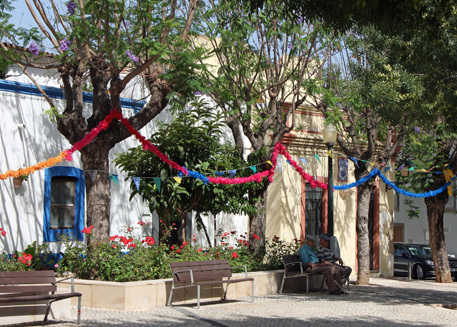 Art and music are very popular in the Algarve, with the region being known for pottery and ceramics. Hand-painted pottery and azulejos are a speciality in the Algarve, the latter of which are tin-glazed ceramic tiles. There are many ceramic shops and potteries found throughout the region, particularly in the towns of Almancil and Loulé. Given the rich history of the region, there are many amazing landmarks to visit in the Algarve. Decorative churches and centuries old castles highlight some of the incredible architecture of the region, with influences coming from the various eras of the Algarve, especially the Moorish rule that lasted five centuries. There are also countless other historic sights worth visiting, along with some of the country’s best museums and art galleries, offering plenty for any history enthusiasts. 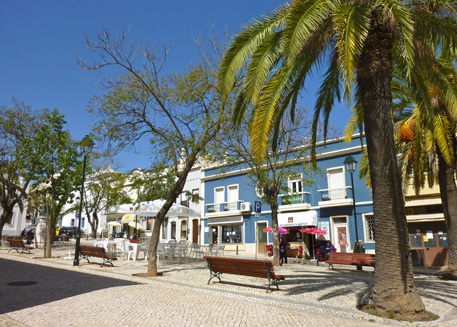 As a prominent tourist destination, there are many popular holiday resorts throughout the Algarve, with most towns featuring a selection of great bars, restaurants, cafes, and shops. The region is also known for its world-class golf resorts, with some of Europe’s best courses located throughout the Algarve, most of which offer stunning views of the coast and ocean. Being located across a stretch of coastline, it’s no surprise that seafood is the most prominent cuisine of the Algarve. With an abundance of fish in the Atlantic, seafood dishes are the most popular in the region, with sardines, octopus, salted cod, and cataplanas being some local favourites. It’s not all seafood however, as the Algarve is known for its incredible PiriPiri chicken. According to local legend, the dish originated in a small village nearby to Albufeira. There is a lot of local drinks to be enjoyed too, including medronho, a traditional fruit brandy that packs quite the punch. The popularity of the beverage means it can vary in quality and production throughout the region, ranging from premium products for the connoisseur to potent homemade local brews without any labels. Also, the Algarve is home to a variety of wines, with Portugal boasting a range of top-quality wine regions. Although not as famous for its wine than other regions in the country, the Algarve certainly has its share of local vineyards producing wonderful wine. Tourism plays a massive role in the economy of the Algarve, with the region attracting millions of national and international tourists each year. Even smaller towns and villages take advantage of the strong tourism in the region, while many world-renowned holiday resorts are found throughout the Algarve. 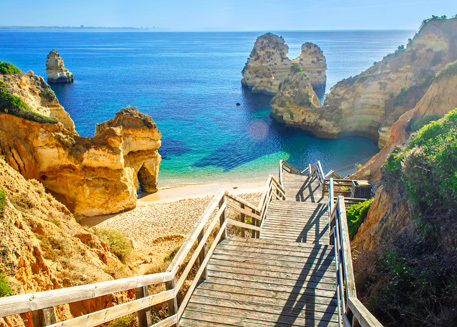 The United Kingdom, Germany and France are among the top visitors of the Algarve, with the warm weather, sunshine and amazing selection of beaches being a key attraction. 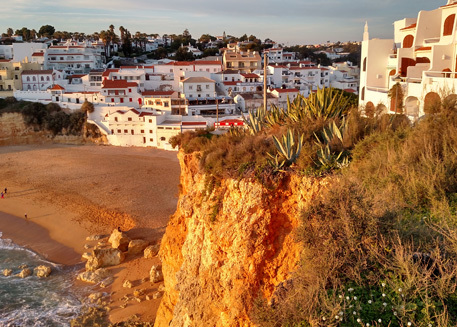 Many tourists in the Algarve are summer residents that have purchased property to visit throughout the year, with low-cost airlines and short flight times making it even more accessible for regular vacations. Beyond the great weather, there are many other attractions that drive tourism in the Algarve. 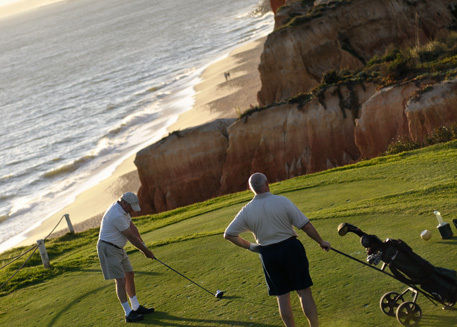 For example, water sports and fishing are very popular due to the Algarve being situated next to the Atlantic Ocean, while the world-class golf resorts attract countless visitors all-year round. 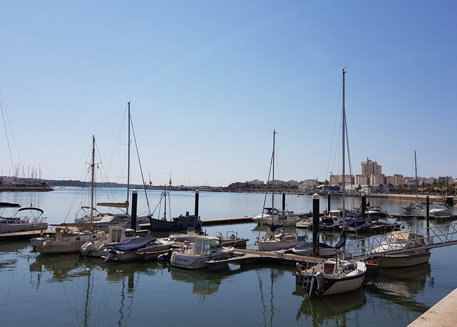 Other than tourism, the Algarve economy is driven by agriculture and fishing, with small fishing villages and towns still prominent in the region.